In some taxonomic classification schemes, Eutheria is the term used for one of the three major branches or clades of mammals that includes extant members, the other two groups being the marsupials and the monotremes. Eutheria is often presented as an infraclass within the subclass Theria within the class Mammalia, with the other Infraclass within Theria being Metatheria (marsupials and their nearest ancestors). As used in this sense, Eutheria includes all extant placentals and those extinct mammals that share a more recent common ancestor with placentals than they do with Metatheria. The order Montremata (echidnas and platypuses) are often placed within the subclass Prototheria. Extant eutherians, their last common ancestor, and all extinct descendants of that ancestor are placentals. Except for the Virginia opossum, which is a metatherian, all mammals indigenous to Europe, Africa, Asia, and North America north of Mexico are eutherians. There are over 1000 extant genera and over 4000 extant species of eutherians, ranging from shrews to whales and from aquatic cetaceans to the volant bats to the terrestrial primates. However, not all classification schemes utilize the term Eutheria. For example, the popular scheme of McKenna and Bell recognize the two cohorts of Placentalia and Marsupialia, choosing not to use Eutheria. In this sense, Placentalia is used synonymous with Eutheria. Eutherians are distinguished from noneutherians by various features of the feet, ankles, jaws, and teeth. One of the major differences between placental and nonplacental eutherians is that placentals lack epipubic bones, which are present in all other fossil and living mammals (marsupials and monotremes). Mammals (class Mammalia) are a clade of endothermic amniotes distinguished from the reptiles and the birds by the possession of hair, three middle ear bones, mammary glands in females, and a neocortex (a region of the brain). The mammalian brain regulates body temperature and the circulatory system, including the four-chambered heart. The basic body type is a four-legged land-borne animal, but some mammals are adapted for life at sea, in the air, in the trees, or on two legs. In some classifications, the mammals are divided into two subclasses (not counting fossils): the Prototheria (order of Monotremata) and the Theria, the latter composed of the infraclasses Metatheria and Eutheria. The marsupials constitute the crown group of the Metatheria and therefore include all living metatherians as well as many extinct ones; the placentals likewise constitute the crown group of the Eutheria. While the classification of mammals at the family level has been relatively stable, different treatments at higher levels—subclass, infraclass, and order—appear in contemporaneous literature, especially for the marsupials. Much recent change has reflected the results of cladistic analysis and molecular genetics. Results from molecular genetics, for example, have led to the adoption of new groups such as the Afrotheria and the abandonment of traditional groups such as the Insectivora. Eutheria comes from the Greek ευ-, eu-, meaning "true/good" and θηρίον, thērion, meaning "beast," and thus "true beasts." Gill named the group in 1872 but applied the term to both placentals and marsupials; Huxley in 1880 recognized the term as used today where placentals are included and marsupials excluded and where the term is meant to encompass a more broadly defined group than Placentalia (Archibald 2001). As with other mammals, eutherians are endotherms and amniote vertebrates, and have at most two generations of teeth, unlike reptiles in which there can be many generations of teeth. In mammals, the articular and quadrate, which composes the jaw joint in reptiles, is incorporated into the middle ear as the outermost two ear ossicles (malleus and incus; reptiles have only one ear ossicle, thte columnella). While in birds and reptiles, the large aorta leaving the heart bends to the right, in mammals it bends to the left (Archibald 2001). Bones of leg and foot of a mammal, Phalanger. 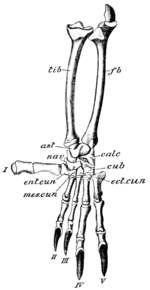 ast, Astragalus; calc: calcaneum; cub: cuboid; ect.cun: ecto-cuneiform; ent.cun: ento-cuneiform; fb: fibula; mes.cun: meso-cuneiform; nav: navicular; tib: tibia: I-V, first to fifth toes. an enlarged malleolus ("little hammer") at the bottom of the tibia, the larger of the two shin bones (Ji et al. 2002). the joint between the first metatarsal bone and the entocuneiform bone in the foot is offset further back than the joint between the second metatarsal and middle cuneiform bones—in metatherians these joints are level with each other (Ji et al. 2002). various features of jaws and teeth (Ji et al. 2002). Whether the term Eutheria is used depends on the classification system used, as well as its rank when the term is used. In a somewhat standardized classification system adopted by many current mammalogy classroom textbooks, there is an emphasis on a split between egg-laying prototherians and live-bearing therians, and the therians are further divided into the marsupial Metatheria and the "placental" Eutheria. This approach is utilized by Vaughan et al. (2000). The following is just the major taxonomic groups taken from Vaughan et al. (2000), without the listing of families and other groups under Theria. In the above system Theria is a subclass and Eutheria is an infraclass. Alternatively, in the system proposed by McKenna and Bell (1997), theria it is ranked as a supercohort under the subclass Theriiformes, and the term Eutheria is not used, being replaced by Placentalia. The McKenna/Bell classification is the most comprehensive work to date on the systematics, relationships, and occurrences of all mammal taxa, living and extinct, down through the rank of genus. The following is a more extensive selection from the McKenna/Bell classification providing a larger overview to the level or orders, with extinct groups represented by †. The oldest known eutherian species is believed to be Juramaia sinensis, dated at 160 million years ago from the Jurassic in China (Luo et al. 2011). Montanalestes was found in North America, while all other nonplacental eutherian fossils have been found in Asia. The earliest known placental fossils have also been found in Asia (Ji et al. 2002). Eutheria contains several extinct genera and larger groups, many with complicated taxonomic history that is still unresolved. Members of the Adapisoriculidae, Cimolesta, and Leptictida have been previously placed within the out-dated placental group "Insectivora," while Zhelestids have been considered primitive ungulates (Rose 2006). However, more recent studies have suggested these enigmatic taxa represent stem group eutherians, more basal to Placentalia (Wible et al. 2007; Wible et al. 2009). Simplified, non-systematic, outline of evolution of eutheria from cynodont therapsids (Ji et al. 2002). ↑ D. L. Rock, and J. P. Hunter, "Rooting Around the Eutherian Family Tree: The Origin and Relations of the Taeniodonta," Journal of Mammalian Evolution 21(issue 1)(2014): 75-91. Archibald, D. 2001. Eutheria (placental mammals). Encyclopedia of Life Sciences. Retrieved April 28, 2014. Hugall, A. F. et al. 2007. Calibration choice, rate smoothing, and the pattern of tetrapod diversification according to the long nuclear gene RAG-1. Syst Biol. 56(4):543-63. Ji, Q., Z-X. Luo, C-X. Yuan, J. R. Wible, J-P. Zhang, and J. A. Georgi. 2002. 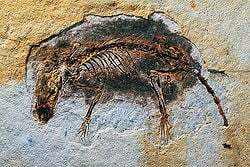 The earliest known eutherian mammal. Nature 416(6883): 816–822. PMID 11976675. Retrieved April 29, 2014. Luo, Z., C. Yuan, Q. Meng, and Q. Ji. 2011. A Jurassic eutherian mammal and divergence of marsupials and placentals. Nature 476(7361): 42–45. PMID 21866158. Luo, Z.-X., Z. Kielan-Jaworowska, and R. L. Cifelli. 2002. In quest for a phylogeny of Mesozoic mammals. Acta Palaeontologica Polonica 47: 1-78. McKenna, M. C., and S. K. Bell. 1997. Classification of Mammals Above the Species Level. New York: Columbia University Press. ISBN 0231110138. Myers, P., R. Espinosa, C. S. Parr, T. Jones, G. S. Hammond, and T. A. Dewey. 2014. Theria. Animal Diversity Web. Retrieved April 29, 2014. Rose, K. D. 2006. The Beginning of the Age of Mammals. Baltimore: Johns Hopkins University. ISBN 9780801892219. Vaughan, T. A., J. M. Ryan, and N. J. Czaplewski. 2000. Mammalogy, 4th edition. Saunders College Publishing. ISBN 003025034X. Wible, J. R., G. W. Rougier, M. J. Novacek, and R. J. Asher. 2007. Cretaceous eutherians and Laurasian origin for placental mammals near the K/T boundary. Nature 447(7147): 1003–1006. PMID 17581585. This page was last modified on 1 May 2014, at 11:55.